Drug overdoses are a growing cause of death, both across the United States and here in the North Country. Nationally, more than 52,000 people died of a drug overdose in 2015 — a sharp increase from about 10-15,000 deaths a year in the 1990s. Some studies predict the drug overdose death toll will rise above 65,000 Americans this year. Drug overdoses are now the leading external cause of death in our country. In fact, around 15,000 more people die each year from drug overdoses than in motor vehicle accidents or gun-related incidents. Drug overdoses affect all members of our society, regardless of race, gender, ethnicity, economic status, religion or other demographic differences. 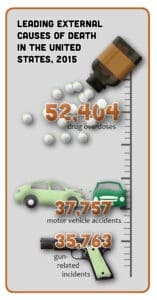 However, overdose deaths do seem to be more common among people between the ages of 15 and 44. In the worst-affected areas of the United States — many of which are located in the Northeast — an estimated 30 to 50 percent of people between 15 and 44 years old die from drug overdoses. While there is not one specific drug that is causing all of these overdoses, national data indicates that opioids have caused roughly 60% of drug overdoses in recent years. Opioids, or opiates, are drugs that are commonly used to relieve pain. However, if they are misused they can cause loss of consciousness and slowed breathing, often leading to death. Common opioids include: heroin, fentanyl, oxycodone, morphine, and others. 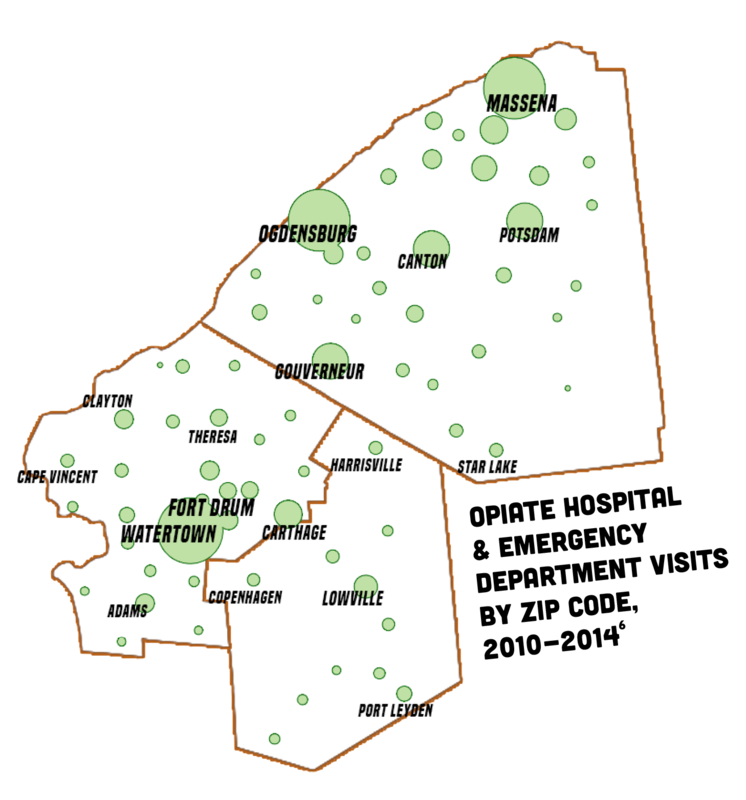 Across Jefferson, Lewis and St. Lawrence counties, roughly 7 percent of households report that someone in their home has been personally affected by opiate abuse or addiction within the past year. While 7 percent may not seem like much, it equates to about 7,000 affected households in the tri-county region. It is important to recognize that opioid medications are not the only method for dealing with pain. There are alternative, non-narcotic options available in our region. If you are prescribed medicine for pain, talk to your doctor about symptoms and other options for pain management. Making sure that all of your medications, particularly opioids, are stored properly and securely can prevent them from falling into the wrong hands. Need to get rid of old medications? Don’t just throw them away. 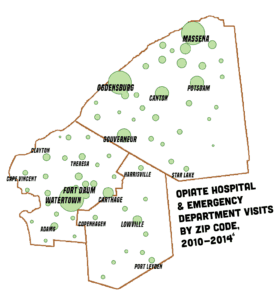 The NYS Department of Health has an online list of safe medication drop-off locations on its website. Narcan, or naloxone, is a drug that can reverse the effects of an overdose and save a life. Since it does not have any negative side effects, it can be administered by anyone during an emergency. Training is now available at all Kinney Drugs pharmacies and at other agencies across the region. To find out more, visit www.getnaloxonenow.org.